Imogen's Typewriter. : Podcast Love #1: Welcome to Night Vale! I couldn't figure out how to talk about podcasts on my blog. A currently listening to post? Some kind of monthly wrap-up maybe? It didn't fit until I was looking through old posts and found my Blog Love series. Then it clicked, a Podcast Love series where I share a podcast that I adore and tell you why you should listen to it! And how could I start it with anything other than the first podcast I listened to. The start of it all for me. 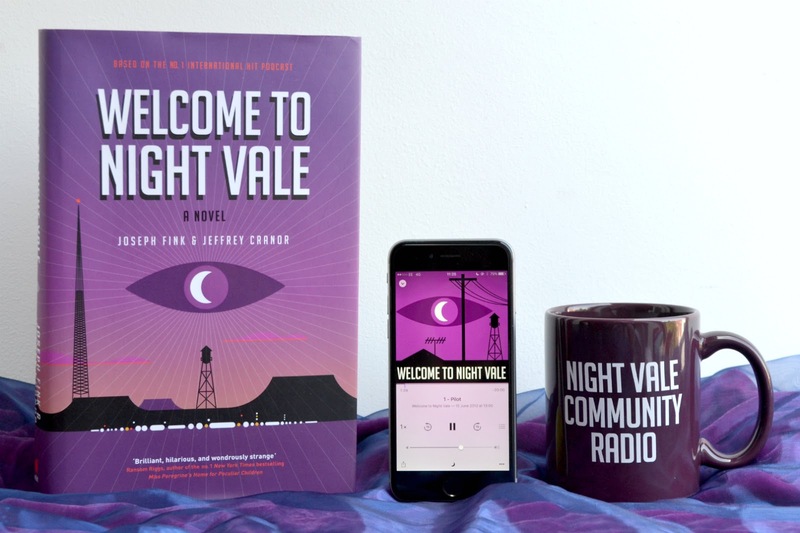 Welcome to Night Vale is a fortnightly 20-30 minute podcast set in the small fictional town of Night Vale; where the sun is hot, the moon is beautiful, and flashing lights move overhead while we all pretend to sleep. Essentially it's a community radio show set in a seriously strange town, hosted by smooth-talking Cecil. The show is diverse, it's weirdly comforting and always positive, and it's the kind of podcast you can listen to in the dead of night when you can't sleep. Taking twenty minutes out of my day to rest and listen to a Night Vale has always been a great self-care exercise for me. It's been going for almost four years now so there's a lot to catch up on. They say you can just jump on anywhere but the early episodes are definitely my favourite. A few people I know have stopped listening to the current episodes, and I tend to find myself going back to listen to older episodes, but I still think it's great now too. There's also live shows, I went to the one in Manchester and it was fantastic, and a novel. Not only that, it's the first podcast I've seen to bring out books of the scripts, which is great for people with hearing difficulties. "Sometimes you go through things that seem huge at the time like- a mysterious glowing cloud devouring your entire community. While they're happening they feel like the only thing that matters and you can hardly imagine that there's a world out there that might have anything else going on. And then the Glow Cloud moves on. And you move on. And the event is behind you. And you may find, as time passes, that you remember it less and less. Or absolutely not at all, in my case. And you are left with nothing but a powerful wonder at the fleeting nature of even the most important things in life. And the faint but pretty smell of vanilla." Have you listened to Welcome to Night Vale? What is your favourite podcast?